Unitor™ FuelPower™ Soot Remover is a dry powder compound formulated for safe removal of soot and deposits from boilers and diesel engine exhaust systems. If deposits are allowed to form on heat exchangers, the loss of efficiency can be directly related to extra fuel consumption. A 1 mm deposit is approximately equivalent to a 10% efficiency loss, a 3 mm deposit can reduce efficiency by up to 50%. The normal ignition temperature of soot is around 600°C. This means that it is burned only in the hottest parts of the boiler or diesel exhaust systems. Due to the catalytic action of Unitor FuelPower Soot Remover, the ignition temperature of the soot/deposit is reduced to less than 280°C. The carbon deposits are thus ignited, leaving an easily removed ash. The use of Unitor FuelPower Soot Remover not only provides greater fuel efficiency, but also prevents acid formation in areas where severe corrosion could result in expensive damage, i.e. heat exchangers, superheaters, economisers, exhaust paths/stacks. FuelPower Soot Remover should be introduced to the boiler through a suitable port, preferably with a blower, ensuring that the powder is spread through the flame path towards the back of the combustion chamber. For Diesel engines, inject FuelPower Soot Remover directly into the exhaust system upstream of the area to be treated. 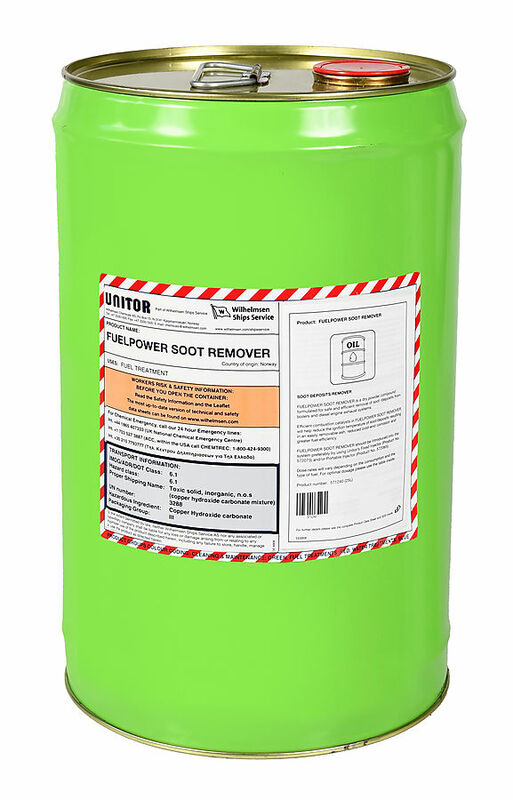 FuelPower Soot Remover is preferably dosed using Unitor’s Fixed Injector, product No. 664 572073 and/or Portable Injector, product No. 664 572065.